Forego a costly sit-down dinner with multiple courses and serve multiple appetizers instead. This is a great way to provide your guests with different options, while allowing them to sit, stand and socialize as they please. Consider dividing your spread into thirds: cheese, crackers and fruit in one section; flatbreads topped with creamy pesto, mozzarella and cherry tomatoes in the middle; and heartier fare, such as chicken skewers and tiny meatballs, off to the right. The “rule of thirds” will serve you well with this resurging trend, too. Melt a pot cheese and then surround it with a selection of breads and a variety of marinated flank steak, chicken, shrimp, and fresh vegetables for dipping. Then, present a selection of wines that pair nicely with the cheese. You can also do this with dessert. Melt some chocolate and circle the fondue pot with chunks of pound cake, marshmallows and fruit. Potlucks are a great way to keep costs down while providing options everyone is sure to enjoy. To ensure all the dishes complement each other, try this: announce that you'll make the two main courses. Let's say they are chicken and Italian beef, two entrees that lend themselves well to all kinds of side dishes. Ask your guests to bring a dish that complements one or the other (or both). You can even buy a packet of recipe cards so that everyone can exchange recipes after they eat. One of the most important elements of any party is the music. Create a playlist of your favorite holiday songs and be sure to start the music before your guests arrive to create an inviting atmosphere. In addition to the music, think of some fun holiday games you and your guests can play throughout the night. Popular options include Charades, Pictionary, Catch Phrase, and Apples to Apples. But there are many others you can pick from, or even come up with your own. 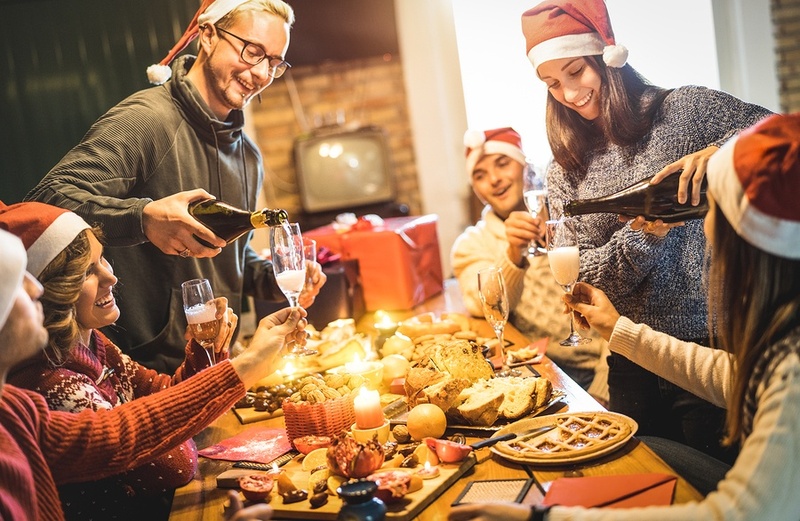 For more holiday hosting tips, check out part 1 of this 2-part series here.